This cap back would have been worn as part of a lace ‘head’, with matching lappets hanging down behind. 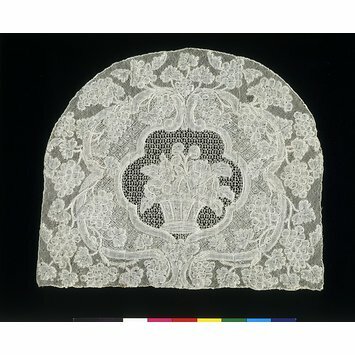 Lappets formed part of a head dress, known as a 'lace head' in the 18th century. It was composed of a curved panel, the cap back, to which two long streamers were attached, called lappets. The whole ensemble was finished with a lace frill. Bobbin lace had been made at Mechlin, a town with various important textile industries situated between Brussels and Antwerp, since the origins of the technique in the 16th century. One of its characteristics was that it was made as one continuous piece, rather than parts that were subsequently joined, and together with the fineness of the particular thread used in its construction, this made it the softest and most delicate of all laces. For this reason it was considered particularly suitable for use with lighter clothing in the summer months. 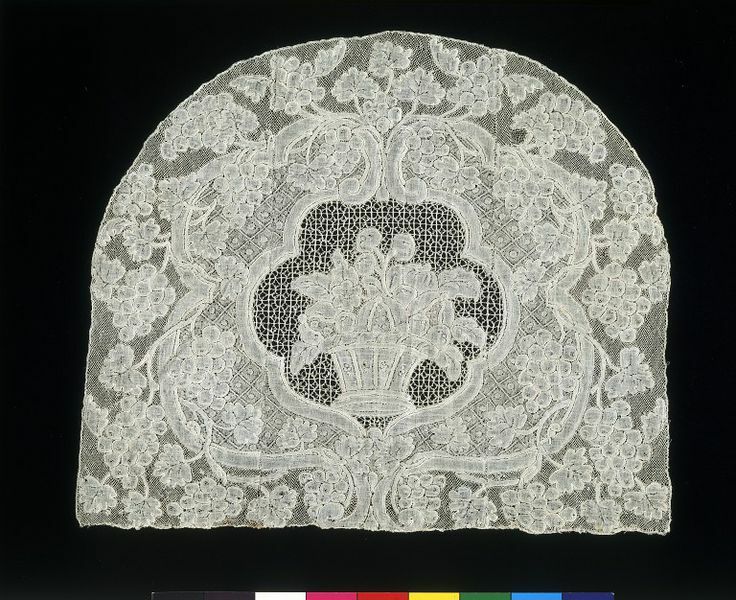 Another characteristic of Mechlin lace was the use of a distinctive, shiny thread to outline its motifs. This gave a clarity that made it particularly suitable for pictorial designs, like this basket of fruit and twining grape vines. Cap back, in Mechlin bobbin lace. Design of a basket of fruit, including melon and cherries, and flowers inside a cartouche, another outer cartouche twined with grape-bearing vines, with a different diapered filling, the inner one on an open geometric mesh.